I make homemade, old fashioned lye soaps, soy and beeswax candles and other healthy products like bath bombs and laundry detergent. My soaps are very moisturizing, made from food grade and essential oils. Many people think that lye soap is harsh, but that is simply not true if it is made properly. With rich oils like olive and almond, cocoa and shea butters, as well as honey and beeswax, my soaps are wonderful and not drying at all. 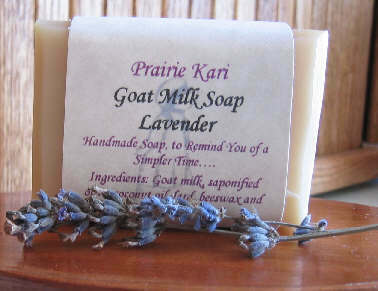 Prairie Kari candles are made from soy wax, from American grown soy beans. I combine this with long lasting American beeswax to make clean burning, long lasting candles. Most candles are made from paraffin which is a petroleum based product. That is why they have black smoke and leave a residue on the inside of the jar. Soy burns clean with no smoke or black residue on the container. Why would you want to burn anything else in your home? Come see my other homemade products too. For more information you can email me at jill@graceevangel.org or go to the Prairie Kari Website.